"…an adorable collection of special thoughts on our animal friends." Our pets. They are our loyal companions and our faithful friends, a constant source of joy and inspiration. This endearing anthology includes poems and prayers for pets, as well as selections devoted to wild animals and blessings for all the creatures of the world. 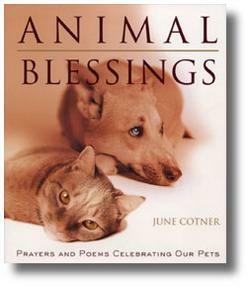 In this elegantly packaged collection, June Cotner gathers readings from sources such as Emily Dickinson, Doris Day, Albert Schweitzer, Jane Goodall, Robert Frost, and many others, celebrating the animals who are our teachers, heroes, protectors, and dearest friends. Other quotations offer reflection and comfort to guide us through the loss of a pet. Animal Blessings is a graceful, engaging tribute to the creatures of the world and a perfect gift book for animal lovers everywhere!